Copper Box Arena, London - In a bout for the British, Commonwealth cruiserweight titles, 2016 Olympian Lawrence Okolie (12-0, 9 KOs) stopped veteran Wadi Camacho (27-7, 12 KOs) in four rounds. 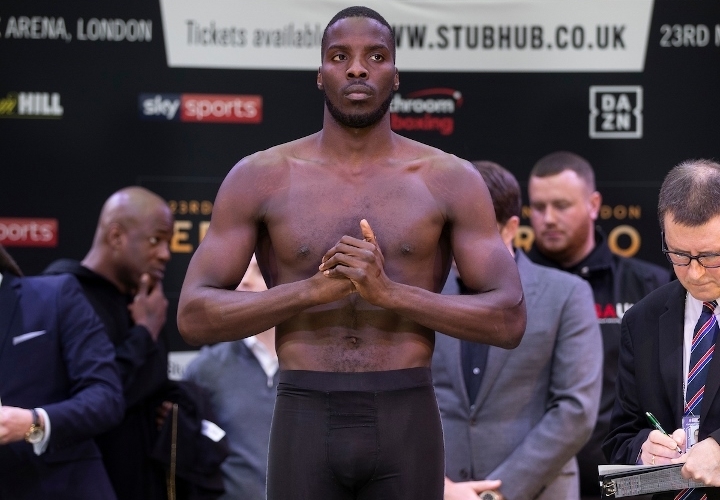 Okolie had predicted a stoppage victory in the early rounds. They went right each other in the first round. Okolie applied a lot of pressure and was looking to push Camacho back. There was a lot of missing and it looked very rough at times with plenty of holding. Camacho would a lot of lunging in the second round, with few punches landed by either boxer. Camacho was doing too much holding. Once Okolie created distance, he began to connect with hard straight punches. Both connected with had shots early in the third. Okolie continued to push forward with heavy punches, while Camacho was being mostly defensive and unable to land much of anything. In the fourth, Okolie landed several hard shots that made Camacho go down to his knees against the ropes. He barely beat the count, but managed to do so. When Camacho got to his feet, Okolie was able to quickly rock him again by a hard right. As Camacho stumbled back to the ropes, the referee quickly jumped in to wave off the contest. The loss snaps a four fight win streak for Camacho. Shannon Courtenay (1-0), who is guided by Adam Booth, made her pro debut, won a four round decision over Cristina Busuioc (0-1-1). The sole score was 40-36. Courtenay appeared to be on the verge of a stoppage in the first round, but Busuioc was able to hold on. Courtenay was too big, too strong and really worked over Busuioc during spots in the contest. Who's left for him to beat in UK? Riakpohre, Kennedy? Might be worth going to Euro level next, looks like a good match-up on paper against Ngabu. If Okolie comes through that, then go for Lebedev but not before.